Thanks to a source, BGR got their hands on information meant for Best Buy reps, which deals with how the retailer plans on selling the Palm Pre. Because of the shortages that will apparently limit to 4 the number of Pre's each participating store will have at launch, the big box retailer is selling the smartphone in 2 phases. Phase 1 launches Saturday, June 6th and runs until July. During that time period, advertising of the Pre will be "minimal" and stores could go weeks without having inventory replenished. Employees will not be allowed to purchase the device and sales will be limited to one per customer. Phase 2 starts in late July/early August when stores are expected to get a larger number of handsets to stock. During this phase, it is expected that there will be no shortages. Right now, it is expected that only 300 stores will have working demos of the Pre. The remainder of the stores will be selling their entire inventory. 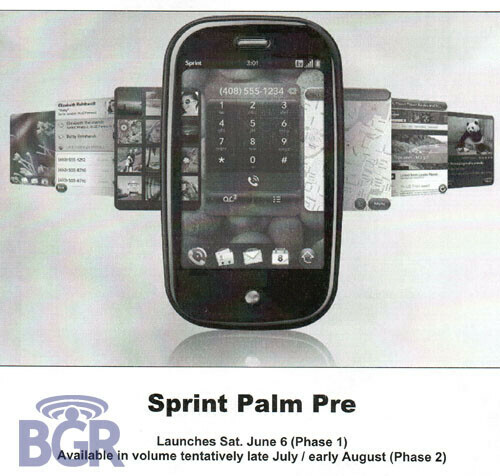 Until Phase 2 brings a tidal wave of phones to the stores, the allotment of Pres will depend on how many Sprint phones were sold previously at each unit. I can't wait till this phone tanks.